It's time for a new challenge at the All Things Unity Blog! 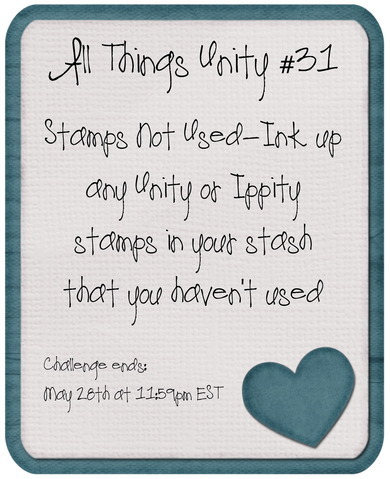 This 2 week challenge is to ink up your Unity/Ippity stamps that you've never used. 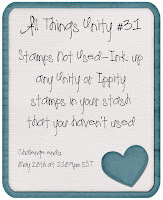 We all have stamps in our collection that need some lovin' so get out those uninked Unity/Ippity stamps and play along! Thanks to the gals at ATU for having me as a Guest Designer this month! I inked up the following Ippity stamps: Dots For Sure, Book It! 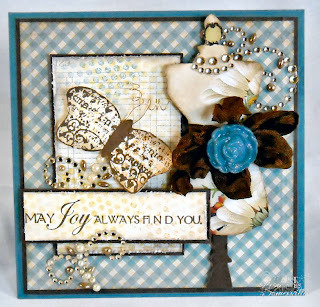 and Thoughts from the Past, along with the sentiment from Unity's Right Words set and the Butterfly from Unity's Fresh Beginnings set to create my card. The Book It! image is inked in Pumice Stone Distress Ink, stamped off then stamped on Vanilla card stock, I added the Dots For Sure in Stormy Sky, Mustard Seed and Dried Marigold Inks, then stamped some of the script from Thoughts from the Past in Ranger Coffee Archival. Sponged the edges in Ranger Pumice Stone, then distressed the edges. On the leftover panel, I stamped the sentiment from the Right Words set. The Dress Form Die is cut from a piece of Websters Pages and Chocolate Card Stock. I dyed some Seam Binding with Ranger Walnut Distress Stain and added a Making Memories Button. To add some texture to the card stock, I ran score marks 1/4" around the outer edges with the Scor-Pal, and added some Prima Gems as embellies. very beautiful .i like the dress form! Beautiful card. Love how you used the dress form. Very elegant! What a fun card! Yesterday I went to a Rubberstamp Expo and the 1st booth I saw was Unity. Oh, did I have FUN!!! I can't wait to stamp with my new acquisitions!!! Love this!! Just so fabulous...love the way you got it all to tie together! This card is so beautifully detailed. Every where you look, there is something to admire and enjoy. Beautiful card, Lisa! I love all the dimensionality in it! Gorgeous card!!! I'm hoping one of these days I'll get one of these beauties in my mail box ;-) I love how you are doing the bow on the dresses. This is just one stunning card. Love the colors, layout and that sentiment. Thanks for the inspiration.